Will this be the first BlackBerry 10 handset? 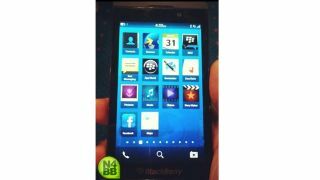 One of RIM's first BlackBerry 10 handsets, the BlackBerry L-Series has sprung a fuzzy photo leak. According to N4BB, the site that acquired the photo through no doubt nefarious means, the L-Series will be the first BlackBerry 10 handset to launch, followed closely by the N-Series. The titular L may come from the BlackBerry London and Liverpool codenames which have petered out of use over the past few months. The site's sources think the handset will launch in a posh-sounding gun-metal grey finish, while the photo shows a number of apps. Because there's not a great deal else to say about the photo, we're going to list them for you: contacts, browser, calendar, BBM, text messaging, App World, a memo app, docs, pictures, music, videos, 'story maker' (video editing, presumably), Facebook and maps. There's also a page marker along the bottom of the screen which speaks of around ten screens of apps, one with a grid icon that could possibly be something to do with multitasking. To be honest, the hardware doesn't look that different to the kit handset we saw in July when we formulated our first thoughts on the new OS in our hands on BlackBerry 10 review. But who are we to judge? We'll have to wait and see what RIM's officially got up its sleeve when it launches its BlackBerry 10 line up in January 2013.